A CLASS-Y AFFAIR The Academy of Construction & Design Class of 2015 with program supporters. Fighting to reach academic success amid family struggles. Aiming to transform lifelong dreams into realities. Searching for jobs in construction or money for college in hopes of building brighter futures after high school. These are the behind-the-scene stories of the Academy of Construction & Design’s latest graduates, who marked new beginnings at the 2015 Annual Meet the Future Luncheon. The Academy has mentally prepared me for the world ahead,” said graduate Taylor Herndon, who plans to attend community college before transferring to a four-year university to study media and communications. Herndon, the recipient of the Isiah Willis Humanitarian Award, praised the program for giving hope to those who choose an alternative to pursuing a college degree. “Even though college is good, you don’t need college to be successful. You can always go into the construction business and be successful. It gives people a sense of hope,” she said. On May 15, during its 9th annual luncheon, the D.C. Students Construction Trades Foundation lauded Herndon and her 14 classmates for their commitment to learning the skilled trades before moving forward to the next step in their lives: going off to college or joining the workforce. “We recognize and celebrate what you’ve accomplished and recognize that this is a great personal commitment,” said Jim Davis, president and CEO of Davis Construction, and the chair of this year’s event. Standing before the Class of 2015 – the last to graduate from the Cardozo Education Campus – Davis acknowledged that the students are the driving force behind the program, which started in 2005 to reinvigorate vocational education in D.C. Public Schools. The Academy is relocating to IDEA Public Charter School in the fall. “Graduation from this Academy is hard work,” said Davis, noting that leadership within the D.C. Students Construction Trades Foundation “corralled” the city’s political leaders, District school officials and construction industry leaders together for a common cause: promoting the importance of education in construction and design to enhance young people’s lives. This year’s award ceremony honored the past, present and future of the Academy of Construction & Design. Two students brought home Norman Dreyfuss Scholarships, competitive awards given to promising graduates to help them realize their personal or professional aspirations after high school. The scholarships are named after Norman Dreyfuss, executive vice president and chief operating officer of IDI Group, and a D.C. Students Construction Trades Foundation Executive Council member. Since 2009, 16 Academy graduates have been awarded more than $40,000 from the Dreyfuss Scholarship Fund. 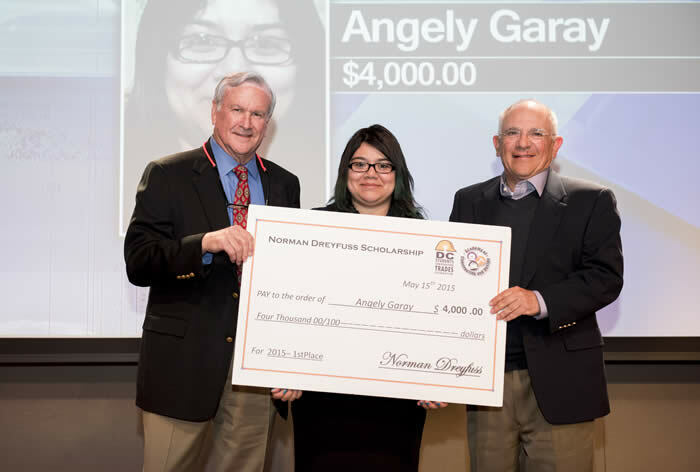 This year’s top honor and a $4,000 scholarship went to Angely Garay, who achieved a 3.4 GPA and ranked in the top 1 percent of her senior class. She has been accepted into Bennett College in North Carolina. “This means maybe it is possible to go off and start something new that I’m afraid of, but still I’m really excited,” said Garay, who hopes to study education and become an elementary school teacher. She also received a laptop as winner of the ACAD Alumni Scholars Award, presented to a student who has completed at least two years of the Academy pathway and is in good academic standing. HEAD OF THE CLASS Grad Angely Garay (center) takes top honors for the Dreyfuss scholarship, presented by Miller & Long’s John McMahon (left) and IDI Group’s Norman Dreyfuss. Meanwhile, second place Dreyfuss scholarship winner Damian Humphries received a $3,000 award to help him pursue his college dream: attending the University of the District of Columbia in the fall. There, he’ll be studying plumbing and electrical engineering. “It’s a real honor,” he said shortly after accepting the scholarship. In memory of former carpentry instructor Marshall Janifer, who passed away in January 2014, one student received the inaugural Janifer Outstanding Senior Award. 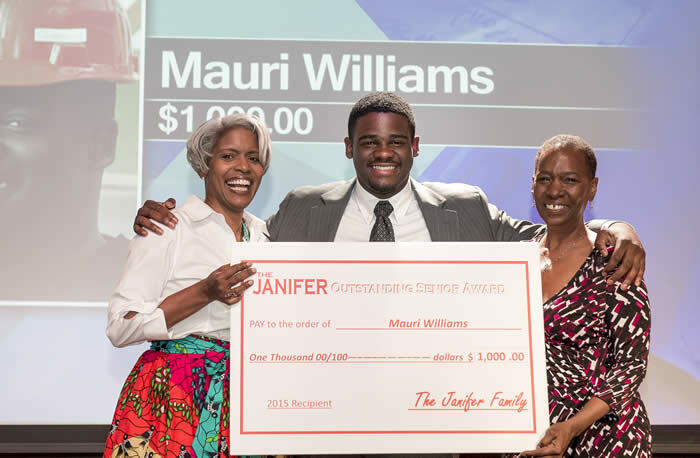 Winner Mauri Williams, who received a $1,000 monetary award, plans to pursue a career with Miller & Long Concrete Construction. He was recognized for maintaining the highest GPA, lowest absences, and highest participation in the program. According to Academy Director Shelly Karriem, Williams embodied the traits that were distinctly Janifer: humble, helpful and happy. “He has his smile and his attitude – that’s my husband,” said DeBoria Janifer, wife of Marshall Janifer, of the award’s recipient. ALL SMILES A beaming Mauri Williams (center) accepts the Janifer Outstanding Senior Award from DeBoria Janifer (far right) and ACAD Director Shelly Karriem. She added that her husband Marshall would have been proud to see his students moving forward with their lives in a positive way. “His heart and soul was in that school and in his students, in the Academy,” DeBoria Janifer continued. “[He] loved those students like they were his own kids.” Naming an award after him, she said, was a way for the family to continue his legacy and to continue to help the kids who were his “No. 1” priority. Regardless of the types of opportunities awaiting students after high school, it’s important for these young people to be job-ready. For many ACAD students, that meant participation in the Bright Futures Bootcamp, a partnership between the Foundation and New York-based nonprofit The Opportunity Network, which focuses in part on preparing students for college and workplace success. While all bootcampers learned valuable interviewing, networking and other job readiness skills, two students – Muhtari Juma and Damian Humphries – stood out for their commitment as participants in the series of professional development classes. 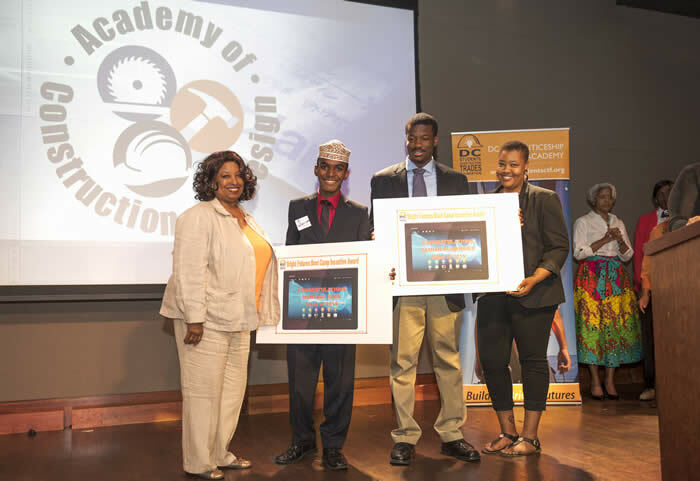 Emille Robinson, co-chair of the Career Fluency Bootcamp program, recognized their good work with Bright Futures Bootcamp Incentive Awards, which came with tablets. PREP SCHOOL (From left) Career Fluency Bootcamp Co-chair Emille Robinson gives kudos to Bright Futures Bootcamp winners Muhtari Juma and Damian Humphries, alongside alongside D.C. Apprenticeship Academy Manager Kavara McDonald. 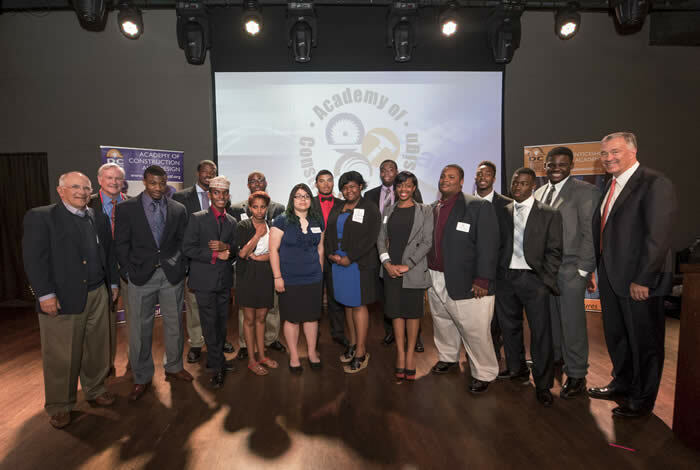 Finally, the Sigal Awards honored Academy students who exhibited “character, quiet competence, good citizenship, competitive spirit and the drive to meet every challenge,” said Beth Moore, program director for the D.C. Students Construction Trades Foundation. 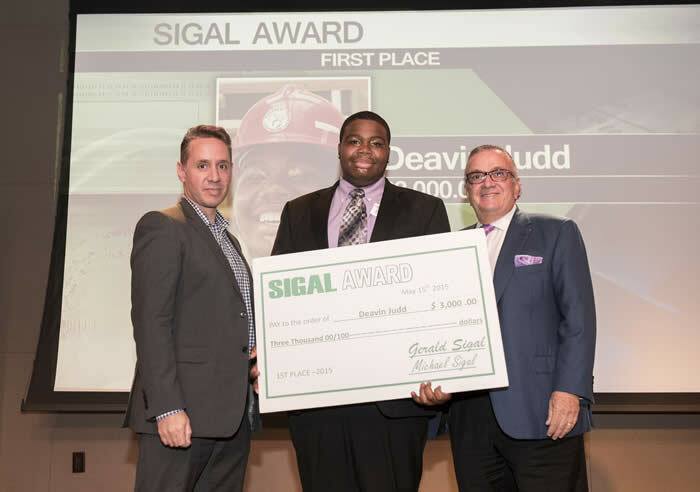 Deavin Judd took home the top Sigal Award, bestowed with $3,000. In announcing Judd as a recipient, Moore said the third-year ACAD student has actively participated in building the Academy’s micro-house project and is “determined to start a business in the future.” He plans to attend Delaware State in the fall. Judd’s classmate, Jamal Fripp, joined him onstage, where he accepted a $2,000 Sigal Award. Moore acknowledged the graduate for racking up more than 360 hours of community service. He, too, will be attending Delaware State and will be studying political science. “It can help me buy books [for school]. This means a lot to me,” said Fripp, whose long-term goal is to become a businessman. EYES ON THE PRIZE Deavin Judd (center) snaps up the first place Sigal Award, presented by GCS Inc.’s Michael Sigal (left) and Sigal’s Gerry Sigal. As a “thank you” for opening doors and new chapters in students’ lives, Academy alumna Ingrid Lopez presented John McMahon with a commemorative stole “as a reminder of the futures you’ve helped to build for each of us and for those to come.” McMahon, chairman of Miller & Long and president of the D.C. Students Construction Trades Foundation, was key in the creation of the Academy. “Thank you, Mr. McMahon, for holding true to the ACAD model of building bright futures,” continued Lopez. McMahon paused briefly before accepting the memento, seemingly surprised by the recognition, like many of the students honored.